It is often very difficult to start a new garden at the best of times, especially if you’ve already had a garden before but it is especially challenging when faced with a completely empty space. There are no existing features to influence the design and nothing else to go on except wall-to-wall grass, covering up who-knows what horrors underneath, a couple of trees if you’re lucky and lots of very new looking fencing. Not knowing where to start was the situation my clients found themselves in, having recently moved from a large country home to a smaller, town house. And the first thing we did was to discuss and clarify the brief. They have busy lives with lots of interests, including gardening and a love of plants, so they did not want to be burdened with maintenance. 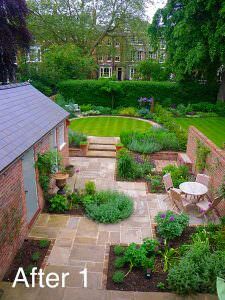 Whilst the garden is a very important part of their lives, they have lots of other calls on their time, so it was essential to their enjoyment of it that the management of the garden fitted into the time they have available to look after it. Clarification of the brief is the step most often left out yet it is the starting point of every garden especially for those that have nothing in them. This garden was a new build with only a tree at the far end of the garden which had to remain in order to conform to the planning application. The design took into account all the things in their brief, including that of keeping the maintenance manageable. 6 years on, the garden is well-used and loved and I can safely say that that it is a success. If you look closely at the ‘Before’ photo, you’ll be able to see the concrete bases of 2 garages, which until recently had been positioned so that the garden had been completely cut off from the house. The lady of the house felt this disconnection very much and her big wish was to have the garden visible and enjoyable from the house because she loved being able to see colour, greenery and wildlife, in particular, the birds from her kitchen and sitting room. 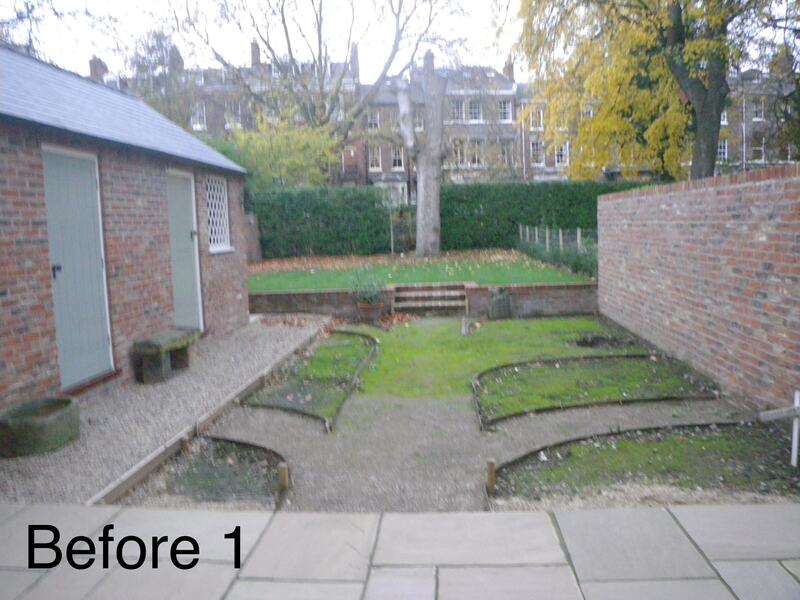 The solution was to knock down 2 of the garages and use the space to bring the garden as close to the house as possible, as you will see in the ‘After’ photo. 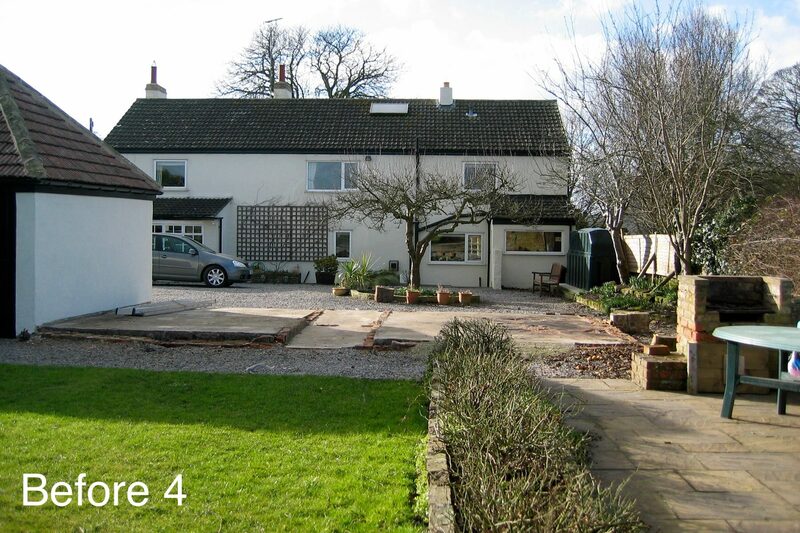 This is still the same house and the client is still addressing the big issue of connecting the house and the garden. 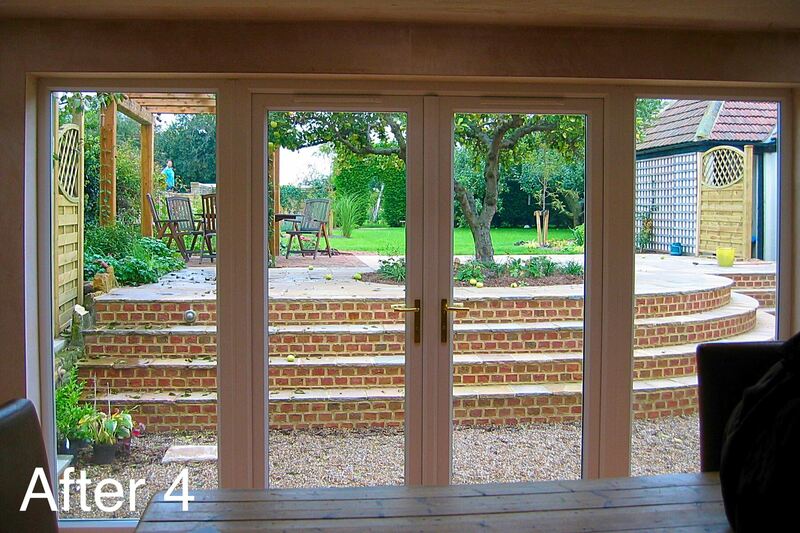 Beyond the new french doors, you can see a set of steps leading up to the garden. This is a very nice way of dealing with a change of level without making the experience of being in the house, which is at the lowest point, feel like claustrophobic. 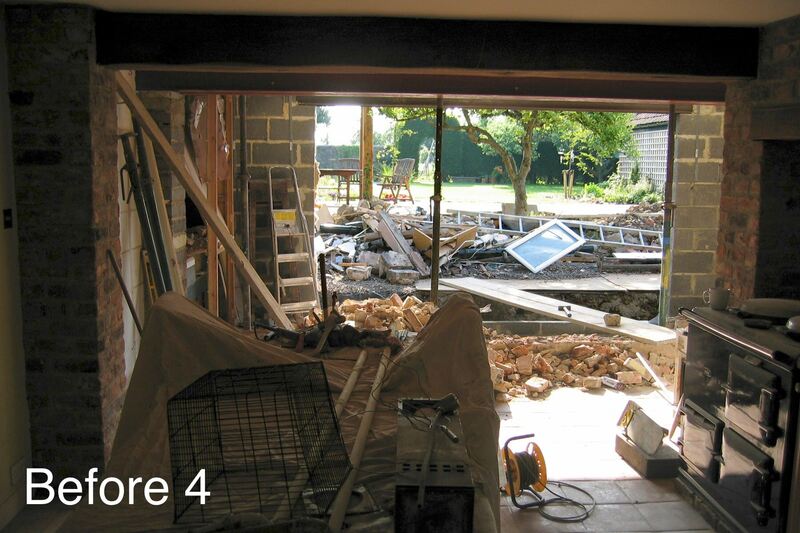 It does not normally require such drastic action such as the removal of 2 garages and the creation of french windows to achieve this vital connection between house and garden so please don’t be put off by the thought of major upheaval. For this house and garden, it was the only option but in most cases, there are much simpler solutions to creating the vital link between the inside and the outside. Eating, reading, drinking a glass of wine or a cup of coffee, having friends round for drinks or a meal, cooking, chatting, watching the sun go down, watching the sun come up, playing games such as boule (petanque),listening to music, playing with the grandchildren, watching the birds, exercising the dog, praying, meditating, keeping pets such as chickens and gardening. There are lots more that could be added to that list but these are the most popular. It is important that your garden is fit for purpose, to allow you to do the things you love, and that only happens with forethought and the right design. Gardens are often used for entertainment so if this is known about when the brief is discussed, the design can often be created so that some areas of the garden are flexible in their use, to accommodate larger than normal numbers of people using it. People can often be put off or frightened by having many plants to look after, yet they can produce the most amazing displays of colour, scent and movement. Part of the job of the garden designer is to establish how much planting the client is comfortable looking after and to make the most of the time they have available and the effort it will take. Quite often people are nervous about looking after a new garden because they don’t know what to do. 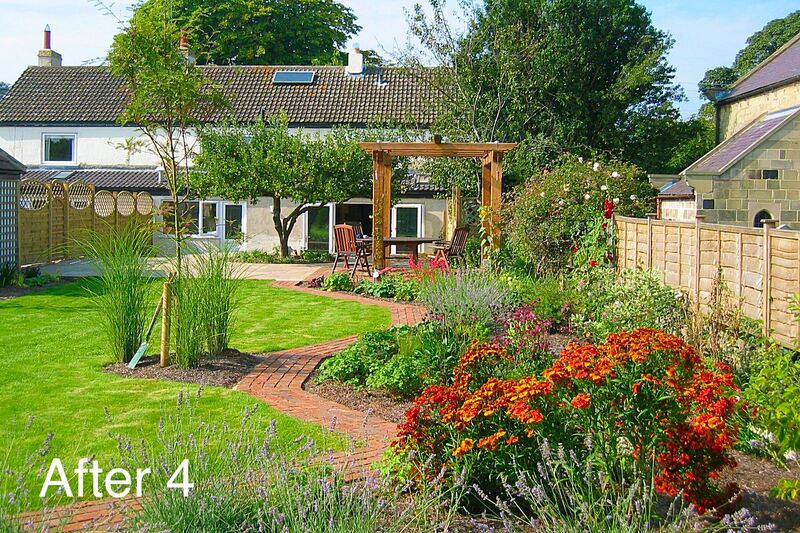 Once the planting plan has been drawn up and the garden planted, clients usually relax and enjoy looking after it because, in this day and age, there is an enormous amount of care tips and techniques available online which encourages, reassures and educates people to care for the plants correctly. Meadows full of colour are understandably very beautiful and very popular. They look like what most of us imagine a wild flower meadow to look like but they are not and there are several advantages to this. These meadows can be planted in a few different ways, giving the client choices over cost, timing and establishment rates. They are created from very specific mixes of plants, giving long periods of colour, usually over the summer and early autumn, and they are an excellent way of attracting wildlife and making the management of some areas of the garden more effective. This temporary garden was created to complement and enhance the experience of theatre-goers to Shakespeare’s Rose Theatre, built by Lunchbox Theathrical Productions, a pop-up replica of an Elizabethan theatre. Both garden and theatre are located for 10 weeks in a central York car park, at the base of Clifford’s Tower, for the summer of 2018. Would you like some ideas for your garden?